Earlier this month, a video surfaced of a cop engaged in a racist rant in Xbox Live, the popular gaming community, with an estimated 48 million users. It turns out that the gamer was in fact a cop and he provided his name, address, badge number, precinct, and other information over Xbox Live. Fortunately, this Mississippi Deputy, who stated that he gets paid to harm Blacks, was fired. The firing of this officer, while commendable, does nothing to dismantle the systematic racism that privileges Whiteness, sustains White supremacy, and unjustly denies Blacks full access and inclusion to participate in society. The firing (or prosecution) of individual officers also suggests that while there may be a few bad apples, they are all otherwise good in the barrel. This negates the culture of complicity within policing that condones these behaviors and does nothing to challenge or correct this embedded culture. This individual act of racism is reflective of the institutional racism that has bred this person’s (and others) contempt for Blackness. And in the anonymous spaces of the Internet, this individual sworn to protect and defend his community (that is 20% Black) adamantly claimed that Black lives don’t matter. 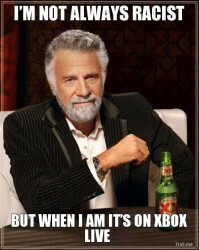 This is the reality in Xbox Live. This systematically embedded discrimination is apparent in Microsoft’s inaction on the issue of racism within their gaming community. Microsoft representatives have even proudly proclaimed that racism was not a major issue. The failure of Microsoft to take racism seriously is a slap in the face of minority gamers who fail to conform to the White male norm. What occurs in Xbox Live is linguistic profiling based on how one sounds within the space. Similar to racial profiling, linguistic profiling occurs when auditory cues as opposed to visual cues are used to speculate on the racial background of another person. Based on how they sound, they experience constant harassment, verbal abuse, and racism. This linguistic profiling occurs on a daily basis and has led to the virtual ghettoization of marginalized gamers in Xbox. Although Xbox Live, and other virtual gaming communities may not be rooted in historical legacies of institutional and structural racism, internet technologies are inherently White and masculine. So rooted in this foundation is the intersecting and overlapping racist policies, practices, ideas, and behaviors that sustain White supremacy. As games are developed, the target audience is young, White, middle-class males who are supposedly the market’s target consumer. Additionally, the power structure of the gaming industry is a predominately white, and secondarily Asian, male-dominated elite. These cultural practices lead to the devaluation of marginalized gamers and developers leading to the perpetuate punishment of Blackness. Blackness is constantly punished in almost all social settings and Xbox Live is not exempt from this trend. Video games are directly complicit in sustaining the narrative that Black lives don’t matter through the stereotypical and racist representations of minority characters, the hostile existence in which Black gamers reside in Xbox Live, and through the failure to diversify the gaming industry. And Microsoft’s continued silence on racist incidents within Xbox Live furthers the notion that only some lives matter; the Black one’s aren’t it. When you intersect ignorance and power, the result is a grave enemy to justice. As W.E.B. Dubois once argued, “a system cannot fail those it was never designed to protect.” And as we are constantly reminded, there is no flaw in the design, this is the design. ~ Dr. Kishonna Gray (@DrGrayThaPhx) is Assistant Professor, School of Justice Studies, Eastern Kentucky University. She is the author of Race, Gender and Deviance in Xbox Live (Routledge, 2014).